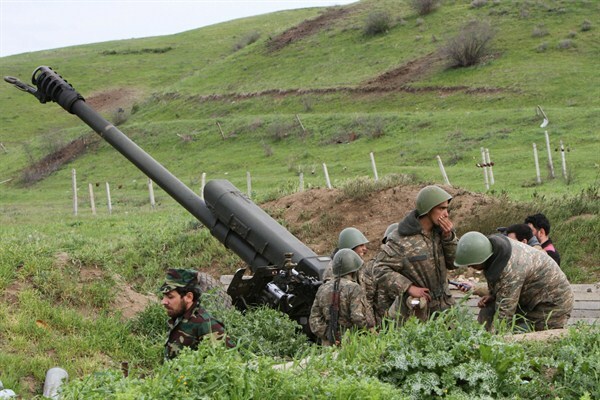 Karabakh Armenian soldiers near a howitzer in Hadrut province, Nagorno-Karabakh, April 5, 2016 (Photolure photo by Albert Khachatryan via AP). The recent bout of intense fighting between Armenia and Azerbaijan along the so-called line of contact near the disputed region of Nagorno-Karabakh should be seen not as an isolated flashpoint, but as the culmination of years of escalating tensions. The regional economic downturn and ongoing tensions between Russia and Turkey only add to the conflict’s volatility.